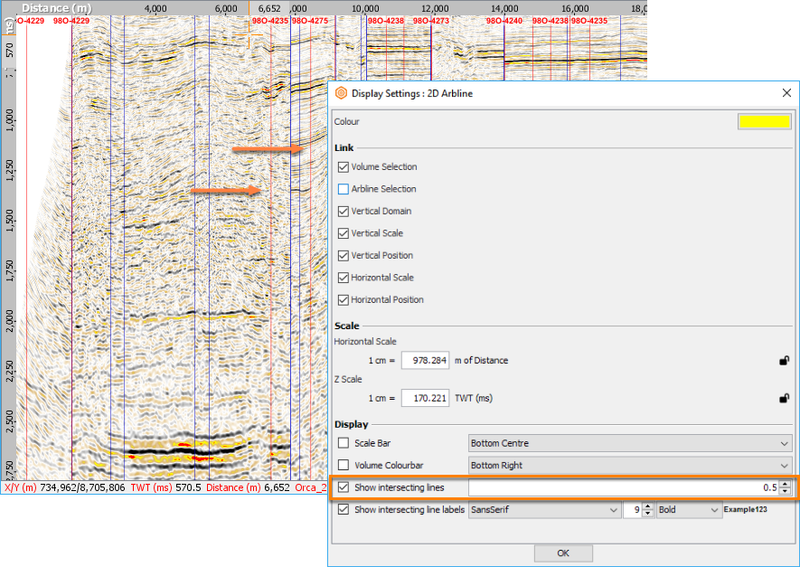 Insight displays data along the arbline in the Arbline and 3D View. As with other views, multiple arbline views can be opened at the same time. Window linking options are available in the Display Settings (see Linking Multiple Views). 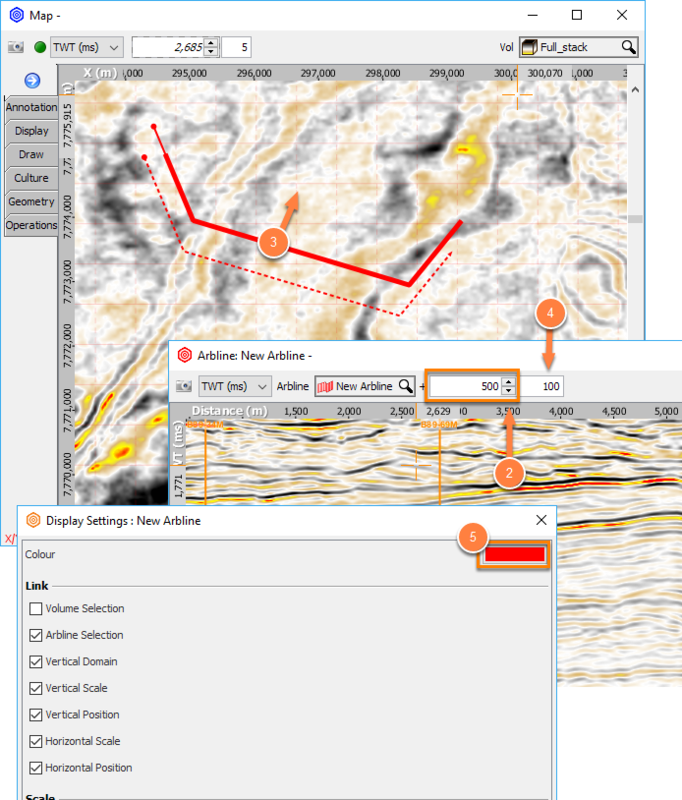 Note: In the Map View, the arbline is displayed with a circle at the start and an arrow at the end (see Creating an Arbline). In the Control Panel, go to the View menu and open the New Arbline View. 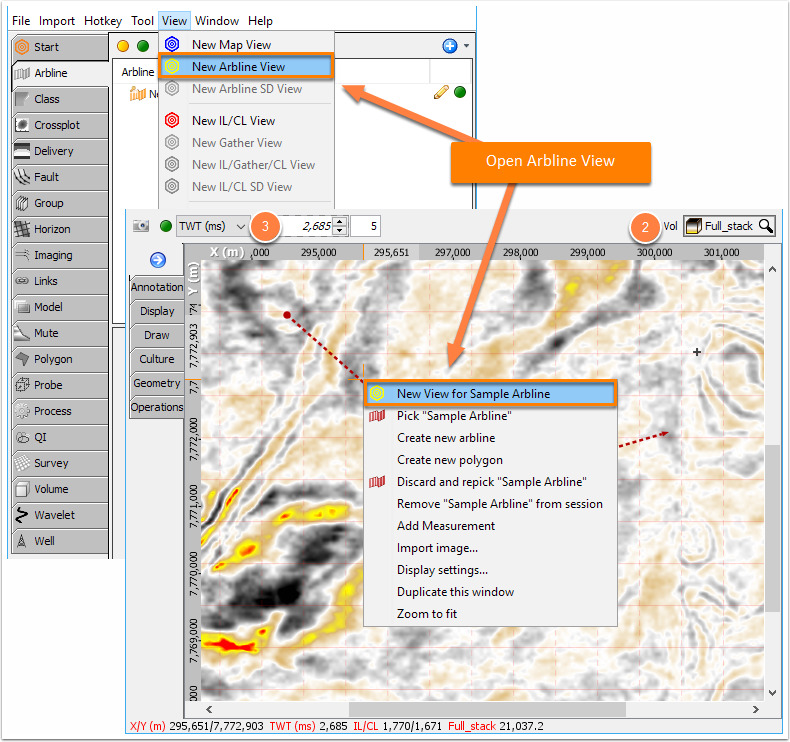 In the Map View, right click on an arbline and choose New View for Arbline [arbline name]. Select the volume to be displayed. Select the vertical domain: TWT, TVDSS or flattened. To identify the location of the arbline markers, use the hotkey Ctrl+Shift+U. Vertical lines indicate the locations of the points where the arbline bends. Tip: The arbline can be flipped along the horizontal axis by clicking Ctrl + R.
2D line intersections show where 2D lines intersect the arbline. These can be turned off in the Display Settings (see Defining Section View Settings) for the Arbline. The size and labelling can also be controlled here. In the Control Panel, go to the View menu and open the 3D View. At the navigation bar, select your arbline from the drop-down list and make sure the circle beside the arbline is green. If it is amber, click on the circle to turn it to green to enable the arbline. Note: Arblines missing from the drop-down list are disabled in the Arbline tab. Open the Arbline tab to enable the arbline. Select the volume you wish to view data from. 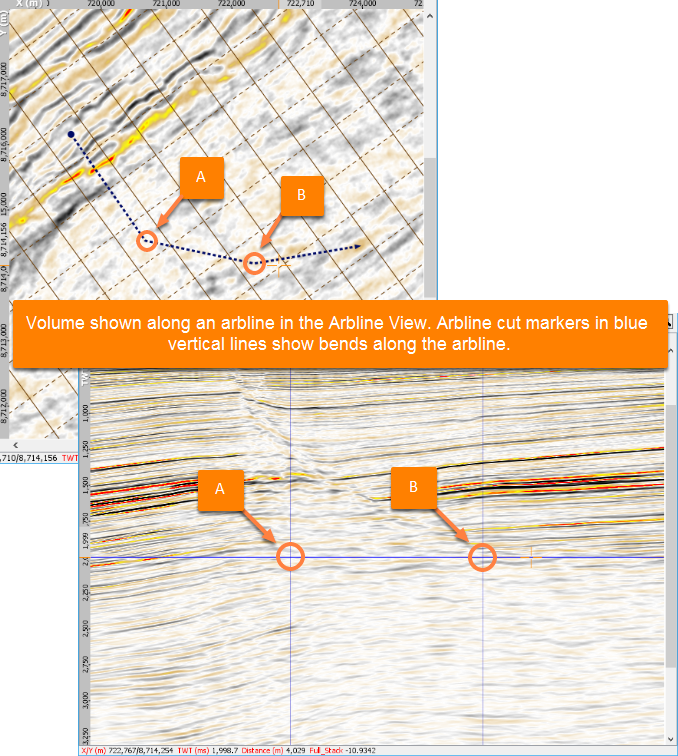 For multiple volumes use a group (see View multiple datasets on an arbline using group) below. Arblines can be shifted by a distance offset, viewing locations “parallel” to the line, without changing or moving the original arbline. The offset shift is available in the Arbline View and the 3D View. In the navigation bar (Arbline View or 3D View), set the offset increment. Press the up/down arrow keys to move the display in the positive/negative direction. Hover the cursor over the spinner box and scroll the mouse wheel. Change the value in the spinner box manually by typing a new value. With an arbline view open, drag the arbline handle away from the original line. Change the shift increment range by adjusting the value next to the spinner box. Change the projection colour in the Display Settings of the Arbline View. The colour is inherited from the assigned arbline colour, see hexagon in the top left-hand corner. 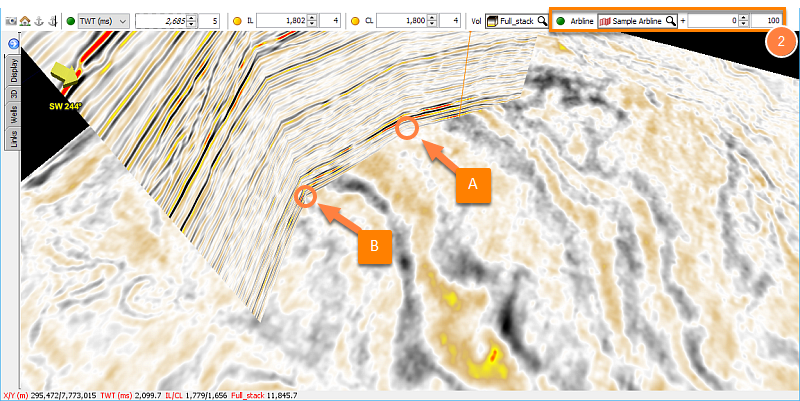 The movement of the arbline can be seen in the Map View, and its direction depends on the orientation of the arbline. Note: As you move the offset arbline, the Arbline View changes to display that location. To reset the arbline display to its original location, set the value in the spinner box to 0.